Dominic Robb doesn’t remember his first victim, the first player whose shot he rejected, the unsuspecting grade school kid whose prayer he swatted back to Earth. And the 6-foot-8, 215-pound Niagara University senior forward, with his 7-foot-1 wingspan, has left a trail of altered field goals and bruised egos that stretches years. Robb remembers a game-sealing block at the end of a tight playoff victory in high school. And he remembers setting the Niagara single-season record with 74 blocks during his sophomore season in 2016-17, surpassing Mark Henry’s career-best 72, a high-water mark that stood for nearly 30 years. And should Robb continue on his current pace, one day soon he’ll eclipse the school record of 220 career blocks set by Joe Arlauckas from 1983-87. Robb has amassed 209 career blocks – just 12 short of a school record – with 10 games remaining in the regular season, including Wednesday’s home tip against Canisius. He’s averaging 2.52 blocks per game this season, which ranks 12th in Division I. It also puts him on pace to break his own single-season school mark. 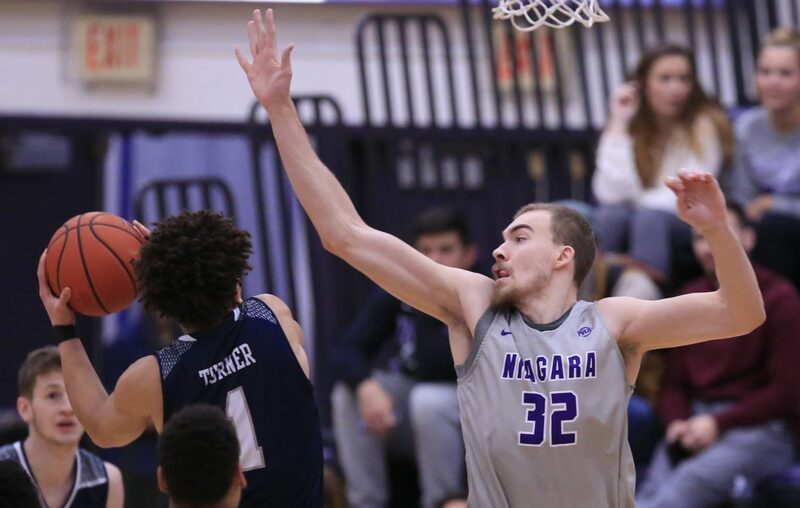 “Most of his blocks get us transition down the other end, and that’s energy, that’s life, that gets you jacked up,” Niagara coach Chris Casey said. “You’ve got a guy that’s getting to the basket, it looks like he’s going to score and then somebody blocks that, gets you out in transition and you score? Robb opened the season with a career-high eight blocked shots – including seven in the first half – in an 80-72 victory against St. Bonaventure on Nov. 12 in Lewiston, finishing one shy of Arlauckas’ school record of nine blocks in a game against Kent State in 1987. St. Bonaventure coach Mark Schmidt remembers it well. And he remembers his team’s game against Jacksonville State two days earlier, when Bonnies freshman forward Osun Osunniyi racked up seven blocks in a blowout victory. The 6-foot-10 Osunniyi – who has a massive 7-8 wingspan – leads the Atlantic 10 Conference with 44 blocks and an average of 2.20 blocks per game. University at Buffalo coach Nate Oats concurred. Casey agreed that Robb’s shot-blocking prowess is innate and said that area of his game has improved with experience, as opposed to anything he has been taught. A good rim protector allows defenders to play more aggressive on the perimeter, knowing they have help in the paint, Schmidt said, and absent that a team needs players who know how to take a charge. No. 18-ranked Buffalo, which doesn’t have that single dominating presence in the post, relies on a team approach, with four players recording at least 10 blocks this season. Senior forward Nick Perkins leads the group with 21, but the Bulls are the most proficient shot-blocking team in Western New York. They rate just outside the top 50 teams in the country with 4.4 blocks per game, according to NCAA stats. “For us, I think it’s one of those things where it shows effort,” Oats said. 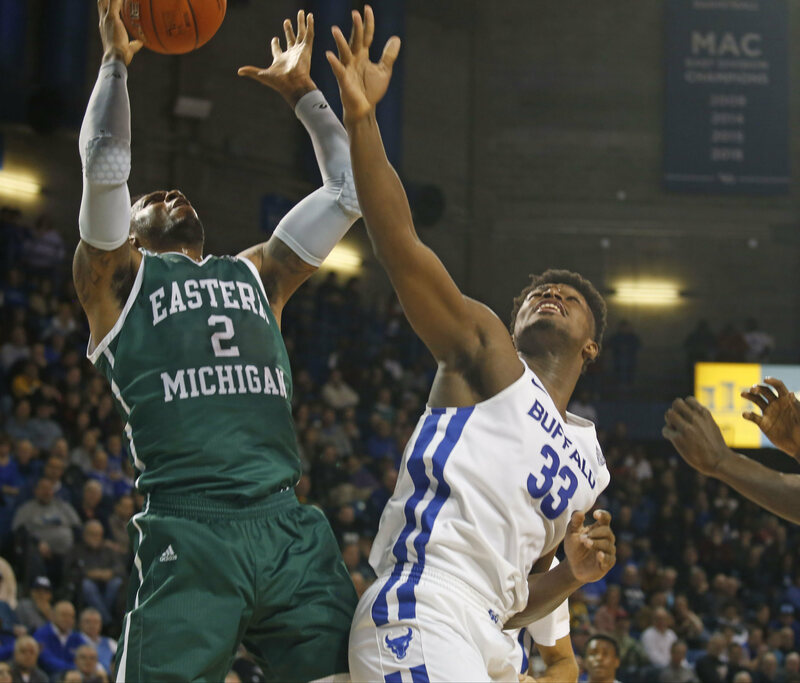 The NCAA began charting blocked shots in 1993, and since that time, the national average has remained fairly consistent, with a small spike in the last decade, according to David Worlock, the NCAA’s director of statistics. Blocks have slightly decreased this season to 3.37 per team per game, down from 3.4 over the last two seasons and an all-time high of 3.66 in 2014. Duke leads the nation this season with 7.7 blocks per game. Former St. Bonaventure center Caswell Cyrus, who racked up 289 career blocks from 1997 to 2000, leads the Big 4 since blocks became an official statistic. He ranks 10th in A-10 history. Former Canisius forward Tomas Vazquez-Simmons ranks second with 273 career blocks from 2008-11. That’s the third-most in Metro Atlantic Athletic Conference history. Former UB forward Javon McCrea ranks third with 250 career blocks from 2011-14. That’s fifth-most in Mid-American Conference history. But all that ignores decades of basketball. Former UB great Sam Pellom, a 6-foot-9 center, is the unofficial king of Big 4 blocks, swatting 375 shots between 1974-78. He also remains UB’s all-time leader with 1,297 rebounds. Pellom, who led the nation in rebounds as a sophomore, is the only UB player to make it to the NBA. He spent just over three seasons with the Atlanta Hawks and part of a fourth with the Milwaukee Bucks before continuing his playing career overseas. He also played for the Washington Generals, the team that faces the Harlem Globetrotters. Pellom is one of four UB players to have his number retired, an honor former Bulls and current Canisius coach Reggie Witherspoon pushed for him to receive in 2013. Robb, a Pittsburgh native who spent a postgrad season at the Hun School in Princeton, N.J., began this season in fifth place on Niagara’s all-time blocks list. He has since surpassed Juan Mendez, Kevin Jobity and Mark Henry. Only Arlauckas stands between Robb and the record. Arlauckas was a fourth-round draft pick by the Sacramento Kings, the 74th overall selection in 1987. The 6-foot-9 Rochester native played nine games in the NBA before embarking on a long and successful playing career in Europe, where in 1995 he teamed with center Arvydas Sabonis to win the top-tier EuroLeague championship with Real Madrid. Robb also hopes to continue his career after college, perhaps overseas, and said the key to a successful block is timing. Niagara senior forward Marvin Prochet sets goals for Robb before each game. The 6-7 Prochet, who has 12 blocks this season, is ninth on the school’s all-time career list with 108 blocks, just one away from tying Sean Schiano for eighth and five away from tying Benson Egemonye for seventh. Prochet said his defensive stats are buoyed by Robb, because when opposing players are concerned with his teammate, it opens opportunities to come from help side. Casey said it’s not always easy to get college kids to focus on playing defense as opposed to scoring, but he and his staff at Niagara preach it relentlessly. And blocks are the last line of defense.